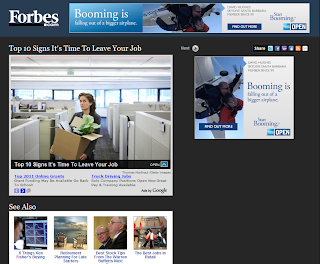 Jenna Goudreau of Forbes.com published a great blog post and slideshow yesterday about the “Top 10 Signs It’s Time To Leave Your Job.” It got me thinking about my own experiences in my role as Dean of Career Management Services for Peirce College. In all that I’ve witnessed when it comes to those top warning signs that it is time to make a career change, there are certainly some common themes, many of them reflected in Jenna’s article. If you liken this professional relationship to your personal relationships, you know it’s time to move on when your heart and mind are in conflict. If you’re no longer passionate about the work you do but you are trying to rationalize staying because of your fears (it’s a tough job market, there are great perks, etc. ), you should consider developing a transition plan. You do not want to stay in a professional relationship that isn’t fulfilling. If your productivity has dropped off, it’s another good sign you need to move on. There’s no such thing as mastering your job. You can certainly improve your skills and the quality of your work, but if you believe you have perfected what you do, you are limiting your opportunity for further growth and development. A good job, like a good exercise routine, will continuously challenge you. Build that sweat equity! Some roles are your home. They’re comfortable, inviting, and reflect who you are. Other roles are like apartments. They serve a temporary need. They are meant to be transitional. It is important to understand the difference and to know whether you should move on or settle in. A sign that a role is transitional is that it serves a purpose for a period of time. If you get to a point where you’ve learned all that you can and have given all of your skills, talents, and energy without a return on investment, it’s likely time to consider this role a resume builder and transition to a more suitable job. We all know in our very spirit when a job is no longer for us. What’s important is that we’re honest with ourselves about when it is time to move on. Don’t let your productivity or demeanor lead others to make the decision for you. The difference between a successful career transition and one that isn’t as successful is your outlook. If you view a career change as a road peppered with obstacles, getting from where you are to where you want to be will be challenging. If you view it as a new route that you’re well equipped to navigate, then it will be a rewarding journey. Don’t wait for your annual review to begin to think about the next phase of your career. The best time to think about your transition is when you begin to lose your edge. So start pedaling! If you need training wheels to get started, the CDS team is always here to help.